NeverSeconds: Hungry Birds once more! tapaa muuttanut suhtautumistamme ja mielipiteitämme kouluruokaan. kun ruokaan suhtautuu negatiivisesti, se alkaa myös maistua pahalta. mielenkiinnolla seuraavien koulujen vierailuja täällä. salaatista. Siinä oli kurkkua, viinirypäleitä ja raejuustoa. pitivät ruoasta, mutta osa meistä ei voi sietää kaaliruokia. there. We also wait to see next schools blogging here. acts like your blog can reach. I've really enjoyed the lunches from Finland this week. 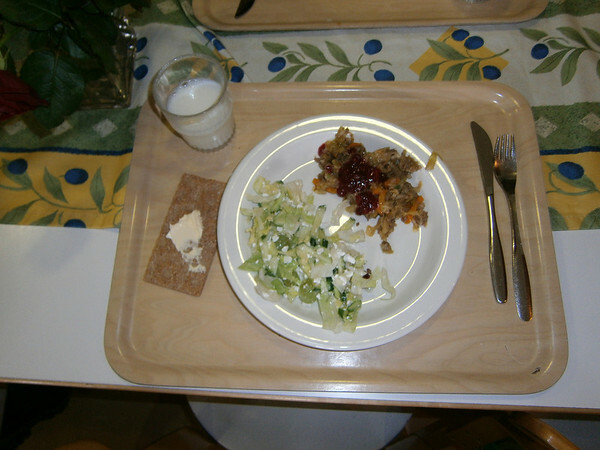 I did some teaching in Finland a few years ago and remember the canteen food quite vividly. It was much better than I expected! Hope the Angry Birds enjoy their trip next week! I love Lingonberry Jam. My family saved it for special occasions to use on 'Swedish' pancakes (It is very expensive here in the USA). I personally wouldn't use it on savory foods though, to me it is a dessert item. I've enjoyed this little jaunt through Finland. The crispbread (I call it hardtack) with butter reminded me of my Grandmothers house, that was 'one' of my favorite things to munch on when we visited (it still is). The Swedish lingonberry jam tends to be a lot sweeter than the Finnish one. Lingonberries aren't sweet at all, but the Swedish add quite a lot of sugar. Thanks to all the Hungry Birds and their Teacher, it is true we can all learn from each other if we try to do so! I look forward to checking out your camp blog, too! I enjoy fruit with my meat dishes also. In the US we are familiar with ham and pineapple or peaches. I like to cook fresh pork with my homemade apple butter (very little added sugar and some apple cider vinegar for tangy flavor). We are also familiar with cranberry sauce served with turkey or chicken, particularly at Thanksgiving. Many times growing up we had Swedish meatballs with lingonberry jam or Indian Curry served with peach or mango chutney, all delicious reminders to add more fruit to our meals! Hi, I'm not sure if anyone has mentioned it, but I really like that all the dishes and utensils used in your lunches are reusable! I think it is especially nice to see the cups are real cups! The tray has a pretty wood grain too. We are in GA (USA) and everything is disposable, usually made of plastic (forks and spoons) or styrofoam (tray), paper napkins and drinks in individual pouches or cartons. Even your tablecloth is very pretty! Seriously speaking, if school lunches were served on disposable units they would probably cost as much as the meal itself. Looks pretty good. I would definitely try it. Hi Hungry Birds!! I think you did a grand job! I enjoyed your entries. Your food was so different, it was very interesting!! I also like the eco-friendly tableware!! Thank you for sharing!!! Enjoy your camp, I still have a few more posts to read, that is the only trouble when away from a computer for a while. But looking forward to a catchup of the events that have happened in the last 2 weeks. Great blog, I think I will put it On my Facebook page! Olen ulkosuomalainen ja todella ylpeä suomalaisesta koulusta sekä ilmaisista ja TERVEELLISISTÄ kouluruuista. Se on maaiLmalla harvinaista! Hieno projekti, kiitos myös opelle!